So I really quite like beer. I never drank beer at all until I went to university and there, rather than being exposed to a binge-drinking culture, I found myself among people with a broad taste and an appreciation for all types of alcoholic drinks in moderation. Before our matriculation dinner (joining the college) we were served a champagne – my first taste – and afterwards, dessert wine, which made something of an impression on me. But beer was drunk in the college bar. And I’ll admit that I drank relatively little beer in college. But there were times and places when it was clearly the best thing to drink – or so my reading told me. After a long summer’s walk up the Cam to Grantchester, a pint of beer was appropriate, and so I found that I began to enjoy a pint or two in the context of visits to country pubs, outdoor exercise and good company. Our student expeditions to the Norfolk Coast – simply to get out of the Cambridge Bubble – would each be completed with a drink in the pub too. Adnams brewery became my benchmark: if Adnams brewed it, I was almost guaranteed to enjoy it, and I used to particularly enjoy any excuse to the Castle, near Magdalene Bridge, when back in Cambridge, because they served Adnams beers too. On moving to Marlow I was spoilt for excellent beer and excellent pubs. 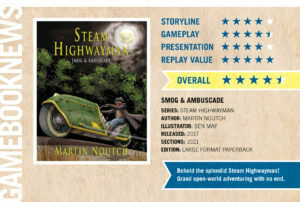 Of course that’s where much of Steam Highwayman: Smog and Ambuscade was dreamt up. I also gave brewing my own beers a go, using canned kits from Wilkos in High Wycombe, and had some satisfying results. The Marlow Waitrose had an excellent selection of bottled beers and I found another Suffolk brewery I could rely on: St Peter’s in Bungay. Now I could write at real length about my beer experiences and preferences – of course, there are magazines of people doing just that all over the world. But essentially I’m reflecting on the fact that just like my exploration of Steam Highwayman country is based on my real experience of the hills and woods around Marlow, so my inclusion of the pubs and the beers is based in fact. A few of the drinking experiences are modelled on specific beers I’ve drunk, some of which remain clearly in my memory and the flavour of which I can recall to my mind’s nose at will. Others are inventions or based on beers I’d like to exist, but don’t yet. There’s plenty more space for beer in books 3-6 and I’ll unfortunately have to do some research in the coming months to do justice to them. 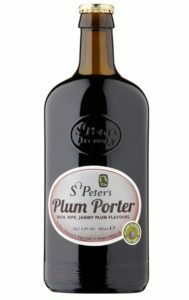 Sitting on my dresser at the moment, still undrunk, is an intriguing bottle of St Peter’s Plum Porter. I have found fruit-flavoured beers over-sweet for my palate in the past, but I’ve got high hopes for this one. Maybe it’s the Suffolk water they have underneath St Peter’s hall that keeps me coming back to try these amusingly old-fashioned bottles of treasure. Well, look out for a Plum Porter featured in The Reeking Metropolis and you’ll know whether I liked it or not. This made my day. Over on the facebook Fabled Lands page, Dave Morris posted a link to two videos taken at MantiCon, the German role-playing and fantasy convention, earlier this summer. The first features Jamie Thomson and Paul Mason and Dave discussing role-playing games and it’s jolly interesting. The second, embedded below, is a longer video in which they discuss the various gamebooks they have written and even some more recent ones they have read. Including, at 1:11:49 onwards, Mr Morris’s interesting response to Steam Highwayman. [Steam Highwayman]is very rich and I look at something like that and think, it’s great because it’s obviously based on Fabled Lands… but now I can learn from him. The rest of the discussion is very interesting to a gamebook enthusiast and includes some great anecdotes of the golden age (the first golden age?) of gamebooks. If you end up having a listen, let me know what you think. ‘Noutch’ isn’t a common surname by any measurement, so I won’t bother him for rhyming it with ‘pooch’ instead of ‘pouch’. I love film music. Let’s just get that right: I love big orchestras telling grand stories with memorable, hummable melodies. Not just ‘mood music’, but story music. Sometimes a great soundtrack can get me writing when I’m stuck for ideas: it can stir up emotions that find their way into my stories or make me long for a better world. So, in a complete change to my recent focus on Steam Highwayman, let me tell you about a piece of music I love. Alex North’s soundtrack to Spartacus is a powerful thing. It merges one of the most beautiful love-themes with clever orchestration and Roman brutality and imagines a world different to our own. The love theme has been adapted and even become a part of the jazz repertoire, but it’s in the context of the movie that it means the most. You first hear it when the bitter gladiator Spartacus sees a beautiful slave-girl, Virinia, and first begins to dream that life could be different to anything he’s ever known. They enjoy an all-too-brief relationship with a beautiful blossoming of tenderness and freedom before Spartacus is defeated and crucified, along with his rebels. In the final scene, the love theme struggles to make itself heard again beneath the Roman cymbals and horns, as Virinia introduces her lover to his baby son – who has been born free. It makes me cry. This might be just a film from sixty years ago, with dated performances and dated production values, but that melody can’t get old. It communicates something awful and wonderful – that people have died and are dying to see their children free to live freely. After all that music, it’s the swell at 2:29 that brings tears to my eyes, just before the Roman theme stomps in. Real sacrifice like this is both tragic and beautiful: it’s there when an economic migrant makes the journey to Europe in an attempt to provide for his family back in Somalia, or Sudan, or Syria. It’s there when those with the ability to leave a war-torn city stay for the sake of those who can’t leave. In the movie, the character of Spartacus dreams longingly of a God for the downtrodden: a ‘God for slaves’, and prays that his son one day will be born free. By the end of the film, that’s what the music means: that his prayer has not been in vain and that despite his sacrifice, he has not been ignored. One day I want music like this to accompany my stories.